Herman Miller Eames Compact Sofa by Herman Miller - Authorized Retailer and Warranty Service Center - Aeron, Mirra, Embody, Celle, Eames Home Office Ergonomic chair. Product Story - Why "compact" for a sofa that's six feet wide and seats three? The clean profile of the Eames sofa compact is perfectly scaled for spaces too small for a traditional sofa - in executive suites, lounges, and homes. But you lose none of the comfort associated with the word couch. Impact and seating space in a sleek, slender, minimalist piece of classic mid-century furniture. Design Story - The Eames sofa compact started out as a built-in sofa in the Pacific Palisades home that Charles and Ray Eames designed for themselves in the 1940s. They liked the sofa so much that they developed a freestanding version - first in wire, then the current model, which has been in continuous production since 1954. The design, which looks nothing like the big, plush traditional sofa, is crisp and light scaled. And while it's perfect for smaller rooms and smaller spaces - in which a traditional sofa would look bulky and out of place - it also lives beautifully in larger rooms in which an airy, modern look is desired. Comfort in Tight Spaces - With all the comfort you expect from cushy, heavy sofas, the Eames sofa compact sits well where bulky traditional sofas can't. In your home's vestibule, study, craft or sewing room, or home office. In executive suites, lounges, and reception areas. In small apartment living rooms, where it provides plenty of seating without ruining the scale of the room. Strong and Durable - The two foam pads that constitute the sofa back feature a reinforcing cord welting detail. 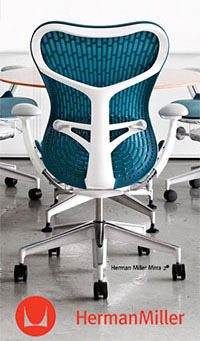 Urethane foam seat cushions are supported by fabric-reinforced rubber webbing on a steel and wire-spring armature. The steel frame is black enamel, and the tubular steel legs are chrome plated. Stainless steel glides have rubber bases.